Great Mobile Phone Deal: Wow this FREE Nokia N96 from Mobiles Please. One of the most impressive phones released in 2008 and probably the most anticipated too is the Nokia N96. The Nokia engineers have worked hard to produce this phone and the wait has been well worth it. The marketing campaign for this smart phone has literally taken the N96 into orbit. From the moment you take the Nokia N96 out of the box you know that it is a decent bit of kit. It’s quite a big phone, once held in the hand its streamline and not heavy at all. The Nokia with its smooth lines and curvaceous exterior is quality indeed. The buttons on the N96 are not at all confusing meaning operation is easy. 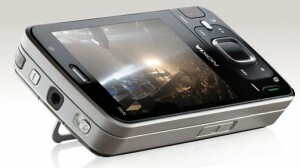 The specification of the N96 will exceed most phone enthusiasts needs. The 16GB of flash memory will not disappoint. Compatibility with the BBC iPlayer means that you can stream BBC television content to the Nokia N96 and radio broadcasts too. The Nokia N96 has had an operating system upgrade meaning reliability is foremost. You can be confident that you will have a phone with a stable operating system. The Symbian OS is indeed different to others, here at Mobiles Please we can’t get enough of it. Mobiles Please have the Nokia N96 available on the T Mobile Network and Orange Network too. The Nokia N96 has a great music player that supports most music formats. The FM radio on this phone is extremely good too, we particularly liked the RDS feature. The ease of use with the Nokia N96 comes into its own with the hands free feature ( hands-free speaker) and independent voice dialling too. Talking ring tones will also keep you entertained. The data transfer rate of the N96 is certainly not slow with mega fast downloads of 3.6 Mbps. (HSDPA) Connectivity is one of Nokia’s strong points and this phone features a whole range of possibilities from USB 2.0, Blue tooth 2.0, Wireless LAN, 3.5 mm jack for headphones and even output for a television. Overall the Nokia is a device with power and potential all in one. Definite plus points for this phone are the recent firmware upgrade and memory extension.